Most of us choose to holiday in the UK for the glorious scenery and picture perfect countryside, though for many a holiday in the UK is preferred because it doesn't require you to part from your beloved pets; even for a week. It goes without saying that a true family holiday will include that beloved dog or cat and North Devon is blessed with beautiful countryside, beautiful beaches and fantastic people. To that end, we have a selection of dog friendly holiday cottages that are more than happy for you to bring along your favourite pet. Make the most of your holiday with Choice cottages and choose a dog friendly cottage, we have a huge choice of cottages, all exclusive and available at the very best price. So if you are looking for a cottage just a short walk from the beach, or in a quaint village surrounding by fields and forests, browse our site today and book online. Or simply call us about your letting needs and our experienced, knowledgeable staff will help you find perfect pet friendly holiday cottages today. 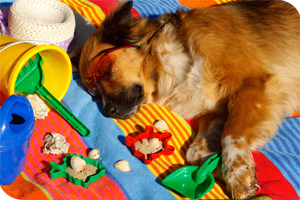 Dog Friendly Beaches & times of the year where Pets are permitted on North Devon Beaches. Teignmouth Town Beach :: Dogs are not permitted between 1st May to 30th September along the seashore between the Slipway at Eastcliff and the Lighthouse. Dogs are to be kept on a lead in and around the Den & Promenade. Hartland Quay :: Dogs not allowed May to September. Westward Ho! Beach ::Dogs permitted October to April (applicable to main beach and rock pool areas). Northam Burrows Beach :: Dogs permitted year round. Instow beach :: Dogs allowed October to April. Saunton Sands beach :: Dogs permitted year round. Croyde Beach :: Dogs allowed October to April. Putsborough Sands :: Dogs permitted October to April. Woolacombe Bay :: Dogs allowed in certain areas. Combesgate :: Dogs allowed October to April. Barricane :: Dogs permitted October to April, and on a lead May to September Note: Beach not accessible at high tide. Hele Bay :: Dogs permitted year round. Watermouth Bay :: Dogs permitted year round. Combe Martin Beach :: Dogs allowed October to April. Lee Bay :: Dogs permitted year round. To view all our dog friendly holiday cottages please see below, alternatively if you would prefer to search by date and criteria please use the search on the left hand side. 2 Bedrooms | Open fire | Parking | 10 minutes drive to the beach! Vibrant, quirky, historic holiday home. Great base from which to explore this wonderful part of North Devon. WiFi internet access included. Review: We all thought the cottage is lovely, We Loved the colours and the pretty crockery. We Also enjoyed the garden and the hammock was popular with the children, We had some great times body-boarding at Saunton and will return as there is so much to see and do in lovely Devon. Thank you for sharing your lovely home. Stay opposite the beach in a top quality holiday apartment with sea views.